Over the last two hundred years, human activities have altered the earth's atmospheric composition. In addition to the burning of fossil fuels, such as coal and oil, certain land use practices, like deforestation, have contributed to an increase in the amount of heat-trapping greenhouse gases (GHG) in the atmosphere. Greenhouse gases like carbon dioxide (CO2), methane (CH4), nitrous oxide (N2O), and water vapor prevent heat from escaping into space, somewhat like the glass panels of a greenhouse. 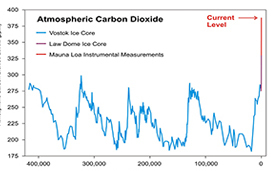 The increased concentration of these "greenhouse gases” in the atmosphere is raising Earth's temperature above historic levels. Even a small rise in global air temperatures has widespread implications for food production systems, coastlines, ecosystem functionality, and human health. 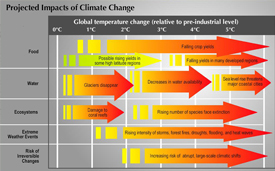 To read more about climate change, read the latest Intergovernmental Panel on Climate Change (IPCC) report (2015). According to recent reports by NOAA, NASA, and the Intergovernmental Panel on Climate Change (IPCC), the Earth's global surface air temperatures have increased at an average rate of 0.15°F every decade since 1901. 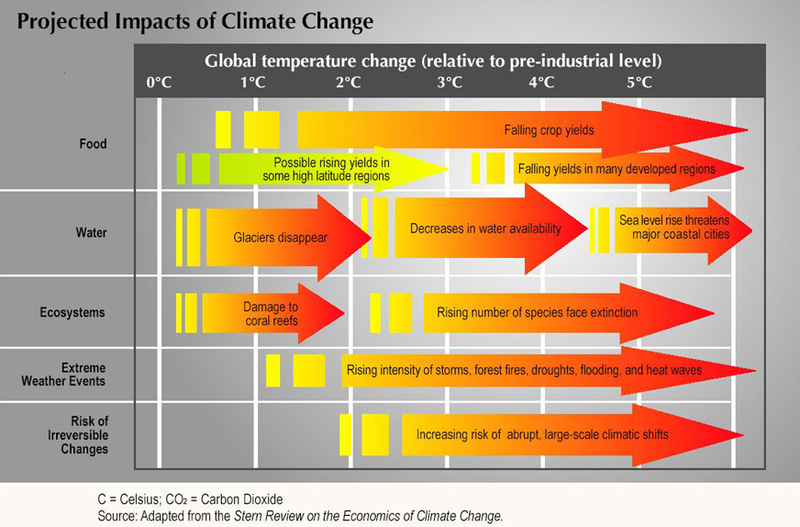 Other related impacts from climate change include variable precipitation patterns, receding snow and ice cover, and rising sea levels. The cumulative effects of these impacts are challenging traditional approaches to how people, industries, and governments manage and use the Earth's ecosystem services. By analyzing trapped gas bubbles in Antarctic ice cores, scientists have been able to determine the chemical composition of the atmosphere over time. 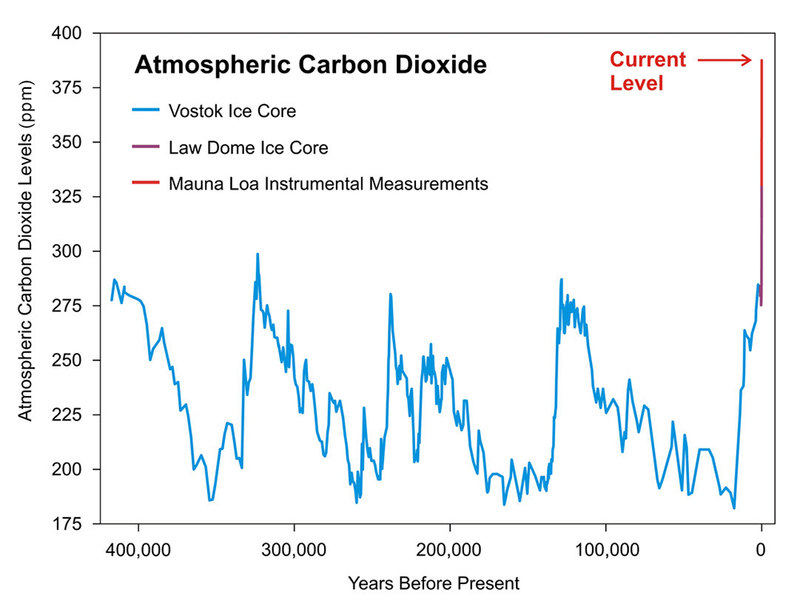 Since 1950, the concentration of CO2 and other greenhouse gases has significantly risen compared to the pre-industrial era, ranging between 280 to 300 parts per million (ppm) of CO2. In May 2013, NOAA first reported daily CO2 averages exceeding 400 ppm and as of May 2014, atmospheric CO2 concentrations were nearing 404 ppm. In order to ensure global warming trends do not exceed 3.6°F (2°C) above pre-industrial temperatures, researchers predict atmospheric CO2 emissions must be limited to 450 ppm. 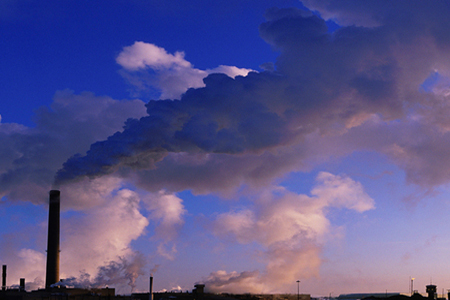 To achieve this, substantial cuts in anthropogenic GHGs will be needed by mid-century. In addition, a broad suite of carbon mitigation strategies must be implemented, including carbon capture and storage activities. Other mitigation measures include increasing transportation efficiency, increased efficiency of heating and electricity production, increased use of biofuels, nuclear energy, renewables such as wind and solar, and biostorage.